It’s the beginning of a new year, and we’re already showcasing timeless designs that are set to increase in popularity throughout the coming months. Some of the most popular 2018 trends, including all-white kitchens and rose gold finishes, are predicted to be replaced with pops of olive green and nature-inspired textures. Interior design in 2019 will aim to create a space that’s modern whilst incorporating classic finishes. Whilst white veined quartz and composites are set to continue being incorporated into many kitchens, navy blue, hunters green and light colour palettes are expected to emerge as some of the most popular colour choices this year. Additionally, whilst rose gold is expected to decrease in popularity, industrial rusty copper will provide a more modern alternative that will be seen across sinks and taps, and surface finishes. Whilst not adding a statement colour, natural textures, such as wood, can provide warmth and depth to a monotonous scheme. Introduced in 2018, the combination of contrasting textures is expected to rise in 2019. A simple way to mix modern and classic designs, incorporating different textures can create an interesting space that’s unique to you. 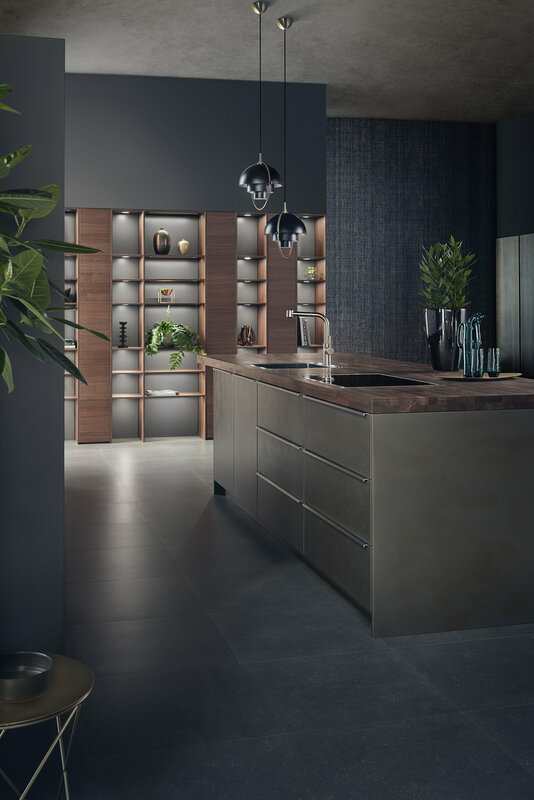 This could be something as simple as combining matte cabinet finishes with leather pull handles or pairing a stone splashback with high-shine marble surfaces. Splashbacks are now expected to upgrade to statement pieces (especially for kitchens without wall cabinets). Now expected to appear in stone, mirror and marble finishes, tall splashbacks will add an area of interest to an otherwise plain backdrop. Similarly, when this is combined with open shelving above, a Scandi-inspired, timeless design will emerge. Streamlined, concealed storage is predicted to continue being a focus of interior design this year. Providing a tidy, minimalist appearance, storage walls are the perfect way to avoid bulky cabinets using up unnecessary space whilst still allowing you to hide away appliances. The Scandinavian-inspired butler sinks are also expected to rise in popularity and are great for storing and hiding away pans and dishes that need cleaning. Digital technology, of course, is continuing to develop, creating smart kitchens that make the cook’s life easier at the touch of a button. Including sous vide cooking methods, 2-in-1 hob/extractors and coffee machines that remember your favourite drinks, the kitchen is literally becoming more intelligent – and is definitely something that the avid chef needs in their home kitchen. Say goodbye to bulky, unsightly extractor hoods with Bora’s integrated venting hob. Seamlessly fitted to a work surface, this hob is accompanied by a flat extractor that vacuums steam and odours as soon as they leave the pan. Additionally, NEFF’s coffee machines are ideal for the caffeine enthusiast. Offering the ability to remember eight different coffee beverages, you can literally have your desired drink served up at the click of a button. Siemens’ coffee machine, on the other hand, can be controlled wherever you are thanks to its compatibility with the Home Connect app. At Contour Kitchens, our expert designers can help you create a kitchen that incorporates modern trends and timeless features – whilst staying true to your personal preferences and needs. To speak to one of our team, or to visit us in store, please see here.